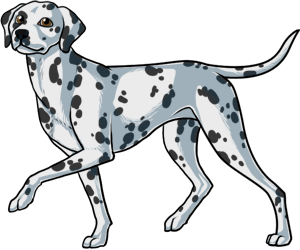 No one is entirely certian of where the Dalmation's specific origns lie, but there have been records from many different countries across the world of spotted dogs like the Dalmation. The Dalmaton dog was know for its desire to guard its owner and horse-drawn carriage. The breed was aslo known for its desire to be with its master, making it a good companion dog. It was accepted into the AKC in 1989, though it was accepted later because the AKC refused to accept that it came from Croatia. Later on the AKC accepted it because the FCI traced the origns back. Today the Dalmation is mainly symbolized as the firefighter's mascot. The Disney movie "101 Dalmations" made the breed's popularity skyrocket, creating puppymilled and inbred dogs to meet the demand. Dalmations are born with plain white coats and develop their spots within a week after birth. In January 2009, a Dalmation had reportedly given birth to 18 live, healthy puppies.